What can be considered the “good” chemicals in textile processing? We’re often asked if ALL the chemicals used in textile processing are harmful. And the answer is (surprisingly maybe) no! Many chemicals are used, many benign, but as with everything these days there are caveats. Let’s look at the chemical that is used most often in the textile industry: salt. That’s right. Common table salt. Safe, natural salt is used in textile dyeing. To dye a fabric made of a cellulosic fiber (i.e., cotton, hemp, linen) or its close cousin (viscose), the fabric is put into water, where its surface gets covered in negative ionic charges. The reactive dyes used most often to dye cellulosic fabrics also develops a negative charge, so the fibers actually repel the dye – like two magnets repelling each other. If we try to dye a cellulosic fabric without using salt, the dye molecules just roll off the surface of the fibers and the fabric does not show much color change. But when salt is added to the water, the solution splits into positive sodium ions (Na+) and negative chlorine ions (Cl-). The positive Na+ ions then dive into the surface of the fabric to neutralize the negative charge. The dye molecules are then attracted to the fiber by weak Van der Waals forces and as the dyes get close to the fiber molecules, the salt acts like a glue to hold the dyes in place. If we add alkali, the dyestuff will permanently grab hold of the fiber and become a part of the fiber molecule rather than remaining as an independent chemical entity. The color fastness of reactive dyes is so good that it’s no wonder that they have become so widely used. And natural salt has been crucial to their success. 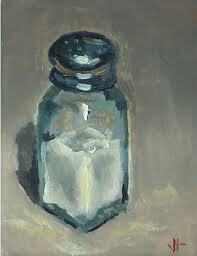 We sprinkle salt on our foods – indeed salt is essential for life itself. But (there is always a “but”) the “dose makes the poison” – and the textile industry uses a LOT of salt! The concentrations to suppress those negative ions can be as high as 100 gm per liter. 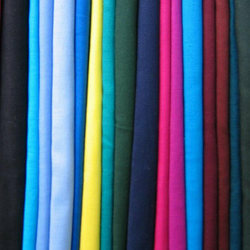 In the worst cases, 1 kg of salt is used to apply reactive dye to 1 kg of fabric. Think of the billions of yards of fabric that’s produced each year: In Europe alone, 1 million tons of salt is discharged into our waterways each year. In areas where salt is discharged into the ecosystem, it takes a long, long time for affected areas to recover, especially in areas of sparse rainfall – such as Tirupur, India. Unfortunately, the salt in textile effluent is not made harmless by treatment plants and can pass straight through to our rivers even if treated. This salt filled effluent can wreak havoc with living organisms. There are some new “low salt” dyes that require only half the amount of “glue”, but these dyes are not widely used because they’re expensive – and manufacturers are following our lead in demanding ever cheaper fabrics. Recycling the salt is possible, and this has been used by many of the dyers in Tirupur, and elsewhere, who operate zero discharge facilities. The effluent is cleaned and then the salt is recovered using an energy intensive process to evaporate the water and leave the solid, re-useable salt. This sounds like a good idea – it reduces the pollution levels – but the carbon footprint goes through the roof, so salt recovery isn’t necessarily the best option. In fact, in some areas of the world where water is plentiful and the salt can be diluted in the rivers adequately, it may be better to simply discharge salt than to recover it. But the best option is to avoid salt altogether. Next week we’ll look at how to do that.